The latest reviewed version was checked on 20 August 2017. There are 6 pending changes awaiting review. The Sanctuary Honor is a component of the Witnessing Master Award . 1 1. Name the three main parts of the sanctuary and the court yard. 1.1 a. Tell what was in each part. 1.2 b. Tell what each piece of furniture represents. 3 3. How many coverings were over the sanctuary? 3.1 a. List the type of coverings in the order from inside to outside. 3.2 b. Tell what each covering represented. 4 4. The following colors were used in the sanctuary and in the priests clothing. Tell what each color represented. 5 5. Discuss and memorize 1 John 1:9, Daniel 8:14, and Exodus 25:8. 6 6. The priests were from which of the 12 tribes? Why? 7.1 a. The common priest. 7.2 b. The high priest. 8 8. Read and discuss The Great Controversy page 488 and Hebrews 4:14-16. 9 9. What kinds of animals were brought daily to the courtyard? 10 10. Write a paragraph or tell how you see Christ represented in the sanctuary and its services. 1. Name the three main parts of the sanctuary and the court yard. The three main parts of the sanctuary and courtyard were the court, the Holy Place and the Most Holy Place. a. Tell what was in each part. b. Tell what each piece of furniture represents. In the map below, North is to the left, South is to the right, East is up, and West is at the bottom. 3. How many coverings were over the sanctuary? The Sanctuary was covered with four layers as described below. a. List the type of coverings in the order from inside to outside. Inner royal liner: Covering was made of red, blue, purple linens. Badger's skin: plain and brown. Note that this passage is translated as "badger's skin" in the New King James Version of the Bible. As the Hebrew term in unclear, it has many other translations, including "durable leather" (NIV), "fine leather" (CEV), "seal's skin" (ASV), or "goatskins" (ESV). b. Tell what each covering represented. Inner royal liner represents Jesus. Red represents Christ's sacrifice. Blue represents His obedience. Purple represents royalty. Gold represents divinity. Woven goat's hair represents Jesus's perfection and purity. The ram's skin dyed red represents the blood of Jesus. The badger's skin represents Jesus covering His divinity with humanity. 4. The following colors were used in the sanctuary and in the priests clothing. Tell what each color represented. g. Silver: Longing Desire - the Hebrew word for yearn (kāsap) shares a root with the Hebrew word for silver (kesap). 5. Discuss and memorize 1 John 1:9, Daniel 8:14, and Exodus 25:8. 6. The priests were from which of the 12 tribes? Why? They were from the tribe of Levi. They had refused to bow down and worship the golden calf. It may be interesting to show here that there were actually 13 tribes of Israel. You will find various tribe lists in scripture showing various statistical numbers such as how many soldiers from each tribe. At the time of the building of the tabernacles the Tribe of Joseph had been divided into the 2 tribes ones Ephraim and Manasseh. The Levites did not provide soldiers to the army or have a portion of the land of Israel, they did have responsibilities for various towns scattered throughout Israel. When the Israelites were camped around the wilderness Tabernacle careful details were given where each of the 12 other tribes were to camp; which 3 on the north, which 3 on the South, east and West. The Levites camped close to and around the Tabernacle. 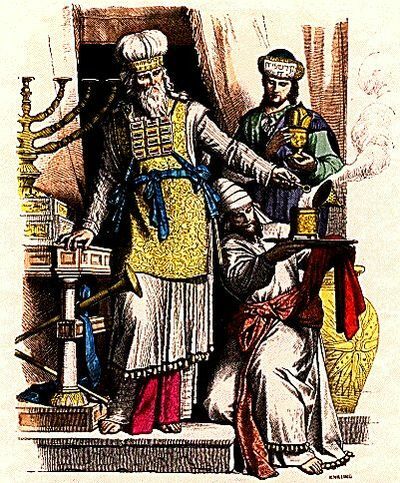 The Levites were made up of 4 main family groups each responsible wore various duties. Looking after the poles, golden items, cloth etc. One family were the Guards and camped at the gate entrance. It is also interesting to note that Jesus had 12 disciples. Jesus representing our High Priest and the 12 others making a group of 13. Moses saw that the people were running wild and that Aaron had let them get out of control and so become a laughingstock to their enemies. So he stood at the entrance to the camp and said, “Whoever is for the LORD, come to me.” And all the Levites rallied to him. Like all priests, the high priest wore linen breeches as an undergarment. The garments were woven of one piece, spotless, without any blemish. Over the undergarment, he wore an embroidered linen coat, again woven of one piece of fabric. The coat was tied with an embroidered girdle. Over this the High Priest wore a one-piece sleeveless solid blue robe. On the hem of the blue robe hung tinkling little golden bells and bright pomegranates. The ephod, was worn outside the blue robe - a shorter garment of gold, blue, purple and scarlet, and fine twined linen. The ephod was fastened at the shoulders with two onyx stones, on each were engraved the names of six of the tribes of Israel. On the ephod the High Priest wore a breastplate made of two pieces of fabric fastened together. In the breastplate, next to the heart of the High Priest, were two onyx stones called the Urim and the Thummim, through which God made known His will. On the outside of the breastplate were 12 precious stones. They were arranged as four rows of three. Their sequence, from left to right and from top to bottom were: sardis (brownish red), topaz (yellow to yellowish red), carbuncle (red), emerald (clear green), sapphire (deep blue), diamond (sparkling clear), jacinth (bright yellow), agate (delicate blue), amethyst (violet), beryl (green-yellow), onyx (bright yellow), jasper (red, brown, or yellow). 8. Read and discuss The Great Controversy page 488 and Hebrews 4:14-16. "The subject of the sanctuary and the investigative judgment should be clearly understood by the people of God. All need a knowledge for themselves of the position and work of their great High Priest. Otherwise it will be impossible for them to exercise the faith which is essential at this time or to occupy the position which God designs them to fill. Every individual has a soul to save or to lose. Each has a case pending at the bar of God. Each must meet the great Judge face to face. How important, then that every mind contemplate often the solemn scene when the judgment shall sit and the books shall be opened, when, with Daniel, every individual must stand in his lot, at the end of days. All who have received the light upon these subjects are to bear testimony of the great truths which God has committed to them. The sanctuary in heaven is the very center of Christ's work in behalf of men. It concerns every soul living upon the earth. It opens to view the plan of redemption, bringing us down to the very close of time and revealing the triumphant issue of the contest between righteousness and sin. It is of the utmost importance that all should thoroughly investigate these subjects and be able to give an answer to everyone that asketh them a reason of the hope that is in them." 14Therefore, since we have a great high priest who has gone through the heavens,Jesus the Son of God, let us hold firmly to the faith we profess. 15For we do not have a high priest who is unable to sympathize with our weaknesses, but we have one who has been tempted in every way, just as we are—yet was without sin. 16Let us then approach the throne of grace with confidence, so that we may receive mercy and find grace to help us in our time of need." 9. What kinds of animals were brought daily to the courtyard? 10. Write a paragraph or tell how you see Christ represented in the sanctuary and its services. Christ represented the sanctuary with many things. For example the animals being sacrificed represents Jesus coming to die for us. The message of the sanctuary was a message of salvation God used its services to proclaim the gospel (Heb.4:2). The earthly sanctuary services were a symbol of for the then present time. Through the symbol and ritual God purposed by means of this gospel-parable to focus the faith of Israel upon the sacrifice and priestly ministry of the world Redeemer, the "Lamb of God" who would take away the sin of the world. This page was last edited on 20 January 2019, at 04:19.